1. Heat oven to 180°C/ 350°F. 2. In small bowl, combine flour, baking powder, baking soda and salt; mix well. 3. In large bowl, beat together peanut butter and margarine with electric mixer until smooth. Beat in granulated and brown sugars, then eggs and vanilla until blended. Beat in flour mixture just until blended. 4. Shape dough into 1-inch balls. On ungreased baking sheets, arrange cookies 2 inches apart. Bake 12 minutes or until lightly golden. If decorating like spiders, remove to cool on baking sheets 2 to 3 minutes. Decorate to look like spiders, if desired. 5. 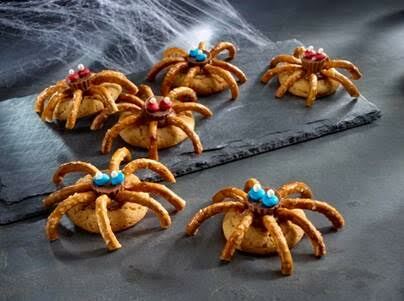 If decorating like spiders, gently press mini chocolate button or chunk into top of each cookie while still warm. When chocolate starts to melt, attach thin pretzel “legs” by placing end of pretzel into melted chocolate. Cool completely then attach mini coated candy pieces for “eyes” and mini sugar pearls for “pupils” with peanut butter. SKIPPY® Peanut Butter has a RRP of £2.25 per 340g jar and is available in Smooth and Super Crunch varieties, which are currently available in major UK supermarkets including Sainsbury’s, Tesco and Ocado.